You can place online orders anytime. 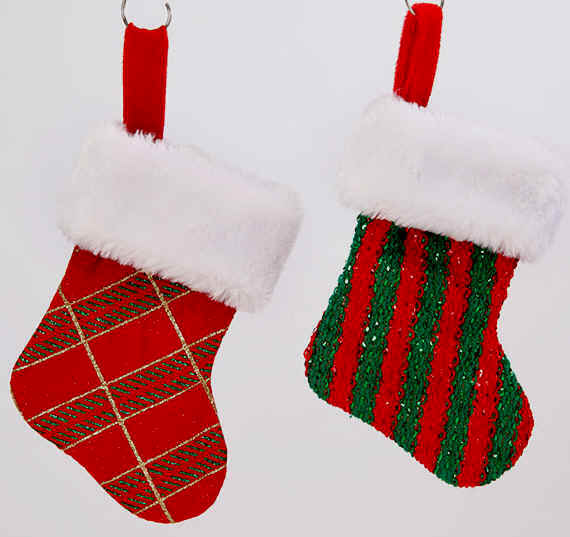 Scroll Down to see Our Huge Selection of Mini Christmas Stockings! Our itty bitty red felt tiny mini Christmas stockings are made of red felt fabric with a white felt scalloped cuff trimmed with tri-color gold braid and red hanger. 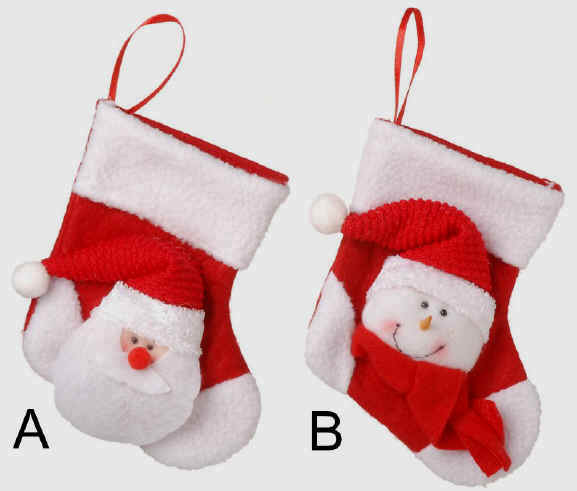 Here are a few ideas for these Cute Little Christmas Stockings. Use as Wedding Favors, favors for Bridal Showers, Baby Showers or just add a bit of charm to your Holiday dinner table. Also, can be used for a gift of Money, Candy, Jewelry, package or Christmas tree decorations. Perfect Small size for Business Cards and Gift Cards. Our most popular Small Christmas Stockings!!! Size Diagonal Length 5" x 3"
Hot Item...Metallic Mini Christmas Stockings come in Red, Gold or Silver Metallic looped fabric. 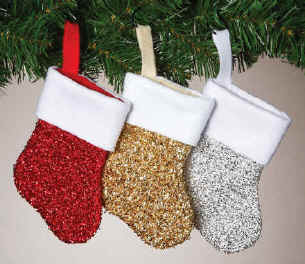 These new Gold, Silver and Red Metallic Mini X-mas Stockings have a big White Felt fold over cuff. These are Elegant Mini Christmas stockings! 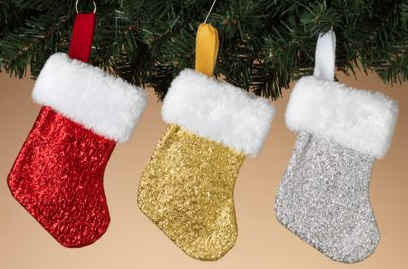 Size Diagonal Length 6.5" x 3.5"
Hot Item...Metallic Mini Christmas Stockings come in Red, Gold or Silver Metallic fabric. 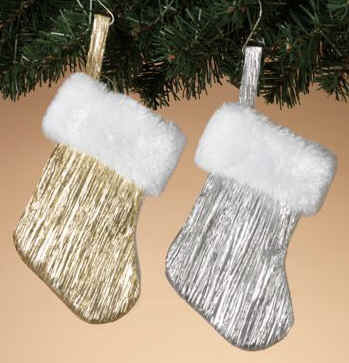 These New Red, Gold or Silver Metallic Mini X-mas Stockings have a big White Faux Fur fold over cuff. New Sparkly and Glittery Mini Christmas stockings! 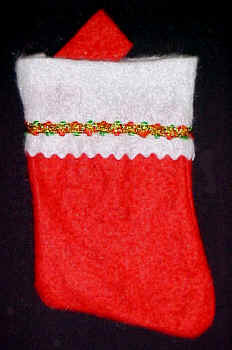 Size Diagonal Length 6.5" x 3.5" Inside width 3"
New Item...Beautiful Mini Sequin Christmas Stockings. These Snowflake Sequined Mini's socks come in three beautiful colors hot pink, purple and blue. They have Sequins sewn on to sheer fabric over satin with a felt back and hang hook. They also have a fold over White Plush cuff. Beautiful Sparkly and Elegant Mini Christmas Stockings! Size Diagonal Length 7" x 4"
These new Gold or Silver Mini Christmas Stockings are so pretty with new pleated Metallic fabric at the boot with a bright White Plush Faux Fur fabric cuff. Each stocking has a matching metallic hanger loop and has a white felt back. 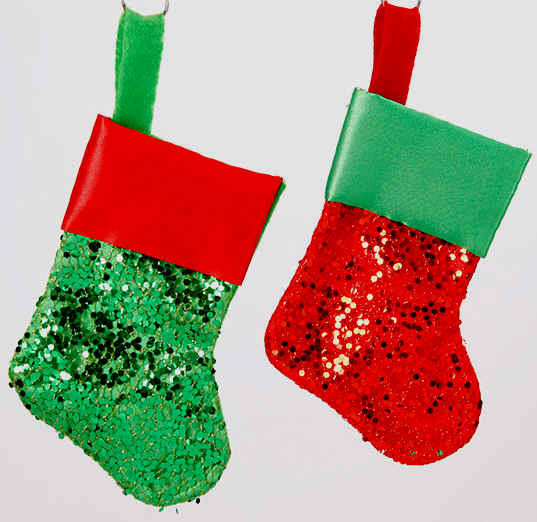 Size Diagonal Length 7" x 3.5"
Hot Item...Check out these New Glitter Mini Christmas Stockings made of glitter fabric with white plush fold over cuff. These Mini's come in two styles and have a felt back and hanger hook. Plaid Glitter Mini Stockings have gold accents while the Stripe Glitter Mini has a red and green sparkle fabric with a velvet hanger hook. Plaid Mini Christmas Stocking or Stripe Mini Christmas Stockings in Beautiful Sparkle fabric! Size Diagonal Length 7" x 4" Inside width 3.5"
Hot New Item...Fancy Mirror and Satin Mini Christmas Stockings. These Fancy Mini Xmas stockings are made with a metallic mirror front, a smooth Satin cuff and felt back. Use these beautiful Fancy Metallic Mirror Mini's for a Gift of Money, for Christmas Tree and package decoration or for Party Treats! or Personalize them yourself on the smooth Satin cuff. Santa Pants Mini Christmas Stockings for Christmas Treats! New Item... Look how cute these new Mini Santa Pants Christmas Stockings are! Made of felt fabric with a black belt, white trim cuffs, gold buckle and suspender straps. They have flat bottom legs so they will stand. Fill with Candy and stand them Up on Your Dinner table! How Cute is that?! Sample Photo of 5" Mini Santa Pants. They hold a 10 oz. bag of Candy Kisses! These Snowman Mini Christmas Stockings are so cute with Snowman faces, hats, scarf's, corn cob nose and rug stitch edging. The cuff is ribbed red fabric accented with white sewn on snowflakes. Each stocking has a red ribbon hanger. Stocking for the Red Hat Ladies! Hot Item...Velvet Money Mini / Dollar Sign Mini Christmas Stockings. High Quality X-mas Mini's are made of velvet fabric that are lined. Velvet fold over cuff is accented with gold braid trim. The front pocket is sewn on and has a Gold thread embroidered Dollar Sign. These min's can be used for a Gift of Money or a Name Tag. Two color styles. Use for Christmas Tree and package decoration or for Party Treats! 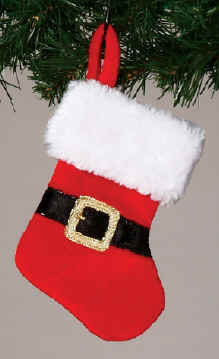 Hot New Item... Look at this new high quality Velvet and Plush Red Santa Belt Mini Christmas Stocking! Made of velvet with an embroidered Santa Gold Belt Buckle and White Plush cuff. These Santa Belt Mini Christmas Stockings have a red velvet hanger hook. Perfect size for candy canes or Chocolate Santa Suckers to stick out slightly out of the top of the Mini Stockings. Great for Gift Card, too! Hand painted Mini metal Holiday candy pails. Cute Santa Claus and Snowman treat pails. Place on your Holiday Dinner table! Use to place candles in, put candy treats, package decorations or hang on the Christmas tree as an ornament. They each come with a Burlap twine hanger. Personalize yourself with a metallic paint pen. Super cute! Size: Pail 2" x 2" Height with handle is 3.5"
Want a Festive Holiday Dinner table? in one of our Mini Stockings! Holiday table looks! How Cute is that? Check out these Cute New 3-D Santa and Snowman Mini Christmas Stockings made of red and white fuzzy fleece fabric with cute details. The Christmas Stocking hanger is red ribbon and are available in two styles. Use for package decoration, gift cards or party treats! Size Diagonal Length 6" x 3.5"
Christmas Goodie Bags, canvas 6" x 6" Red or bright White canvas Christmas Treat bags. Nicely sewn flat Mini Goodies/ Gift/ Cookie/ Treat Bags have two handles made of canvas. Great for Christmas Cookies, Treats, Party Favors! Use these Christmas Candy Bags at your Candy Bar! or just the kids decorate for a Christmas Craft project. Great for any Christmas Holiday Treats! Bag Size: 6" x 6" Height with handle 9.5" Want this Item by the Case? 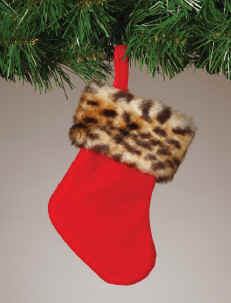 Red Velvet Mini Christmas Stocking comes with an Animal Print Cuff. Animal Print Mini stockings have a wide awesome animal print cuff. 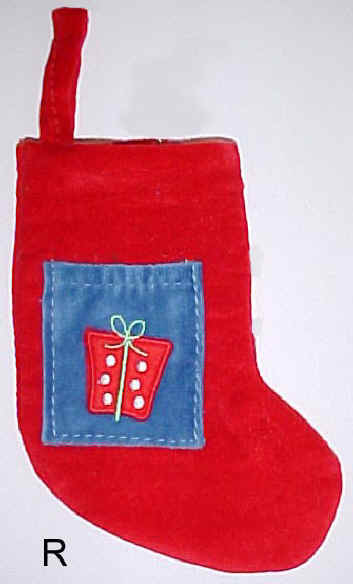 The boot of this Red Mini Christmas Stocking is made of quality Red Velvet fabric. Animal Print Mini's are awesome for the pet lovers! Great Size! Use for Christmas Party Treats or gift cards too! 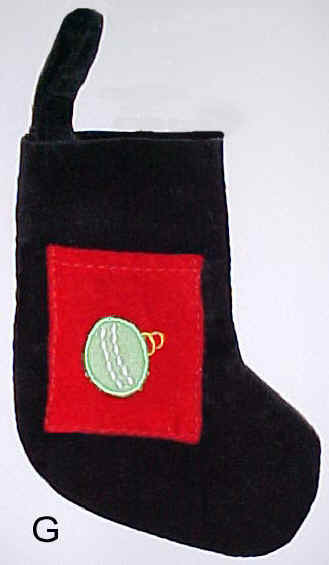 Size Diagonal Length 7" x 4" Cuff Length 1.5"
Beautiful real Velvet Mini Christmas Stockings with embroidered on designs on the pocket. Each stocking has a pocket sewn on the front for name tags, treats, rings or money. Want a festive holiday dinner table? put your silverware in this Mini and put a place card/ name tag in the pocket!! Great for Wedding Favors, too!! How cute is that?!! Size Diagonal Length 7" x 3"
All White Mini Christmas Stocking is made of thick white plush fabric. This solid White Mini Christmas stocking has the same white plush fabric hanger. Perfect White Plush Mini stocking for your silverware, candy treats, gift cards and much more! 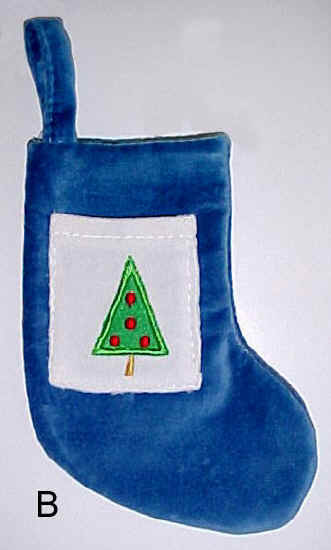 BIG PLUSH CHRISTMAS STOCKINGS 12"
These big 12" Plush Christmas Stockings are the perfect size! Made of lightweight plush fabric with a white fold over plush cuff. The stocking hanger loop is also red plush. 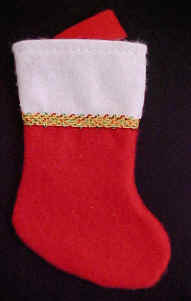 Size Diagonal Length 12" x 7"
New Felt 7" Mini Christmas Stockings come with a red felt stocking hanger. Small Mini Christmas stockings great for Candy Canes, treats, Gift of money, jewelry, package or Christmas tree decoration. Add your own flare and Decorate them Yourself! Great Size! Use at your Christmas Party or Dinner Table! Want This Item by the Case? New Felt Mini stockings with a gold, red and green metallic braid trim. Small Mini Christmas stockings great for candy, treats, candy canes and more! Great Size! Use for Christmas Party Treats or gift cards! Size Diagonal Length 5.5" x 2.5"
Get a Lump of Coal for that Naughty Someone! These Coal Christmas Stockings are actually bags. They are packaged with two lumps of real Coal and a small red drawstring bag with embroidered phrase on the front. 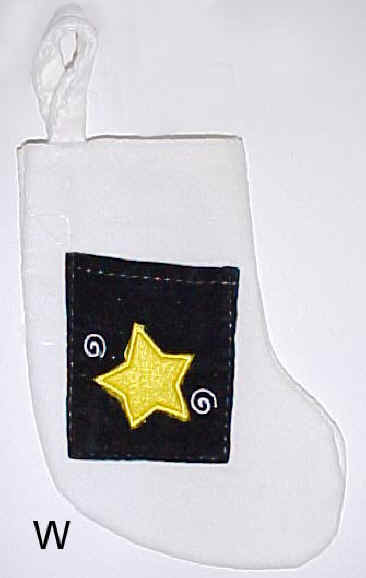 Bag Size 5.5" x 3"
We have a HUGE Selection of Mini, Small, Little, Miniature and Tiny Christmas Stockings. New Dollar Sign Christmas Stockings, Felt, Velvet, White Plush Mini Stockings. Mini Stockings Make Great Wedding Favors, Great for Business Cards and Gift Cards! See Measuring Tips Top of this page for size information. Copyright © 1998 - 2019 The Stocking Place ~ www.thestockingplace.com ~ All Rights Reserved.